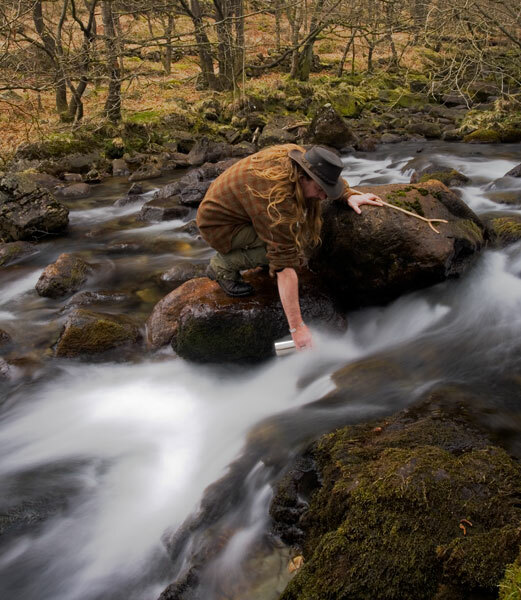 The days of drinking water straight from the streams of Britain and much of Europe without a care are unfortunately long gone. Even in areas where pollution and modern farming methods do not make the water dangerous to drink, other human and animal contamination render much of the surface water in this country and most others unsafe to drink without some form of treatment. Water purification involves two stages, firstly, unless the water is very clean, it should be filtered to remove large contaminates. Then it should be treated either with heat or chemicals to kill any remaining organisms. There are many high tech purification devices available on the market but my personal preference is the use of a thick canvas filter called a “Millbank bag” after the Millbank medical college. Simply filled with the water to be filtered and hung over a collection vessel. It certainly isn’t the fastest method, but it does have the advantage of not needing any manual effort, unlike pump filters. My usual approach is to hang the bag shortly after arriving at a site and leaving it to filter while getting on with other jobs around the camp. After filtration the water must still be treated to remove micro-organisms. In places where a fire is not practical, chemical purification can be achieved with a variety of commercial treatments such as Aqua Mira. If a fire is available then a pot of water or a volcano kettle brought to the boil will kill any harmful organisms very quickly. People often think such methods are time consuming and if you were to time the whole procedure then it would seem so. Wetting, filling and hanging the Millbank bag, 30 seconds. Placing a pot under the bag when water level drops to the line, 10 seconds. 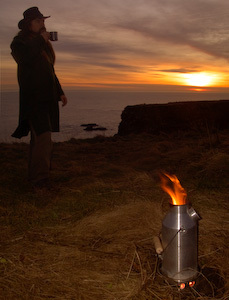 Hanging the pot over the fire when full, 10 seconds. Taking the pot off the fire when boiled, 10 seconds. Although there is a lot more time between these actions the only time it really costs you is the time you are actually doing something. Result? Two litres of water filtered and treated for 1 minute of action, faster than any hand pumped filter I know of. If you want your water cold simply leave it to cool until the morning. Millbank bags can be difficult or expensive to obtain these days but fortunately a good friend of mine has started making his own version, The Bilbank Bag which work just as well for a fraction of the price. 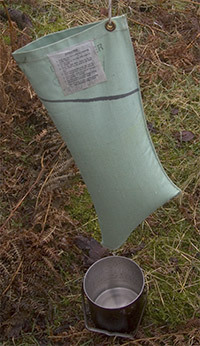 Another source of water that can sometimes be utilised is rainwater collected from your shelter tarp or fly sheet. This can be used with very little treatment in most places. 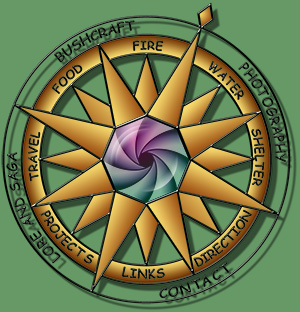 Bushcraft and wilderness skills should always be practised with respect for the environment and other users of the outdoors. Leave No Trace. All text, images and artwork on this site are the property of Gary Waidson and protected by copyright. All rights reserved.